This exercise is also intended to open the chest, but it concentrates on deeper muscles across the front of the chest. To do this exercise you will need a mat. Start by lying on your back with your knees bent and your feet planted in the floor. 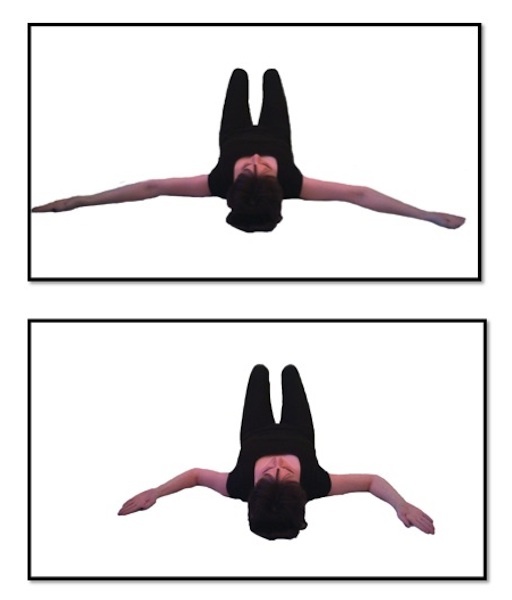 Your arms are in what is called the “Y” position. In this position your arms are out to the side but slightly above your shoulders as if your spine and your arms are making a “Y” on the ground. Inhale to prepare and then exhale as you bend your elbows sliding the elbows along the floor towards the ribs. This is the “W” position. Inhale as you straighten your arm and exhale as you bend your elbows again. It is important to keep your forearm parallel to the floor. The tendency will be to let the elbows drop and your hands to lift. Be sure to keep the chest open so that the arm is even.